a country band from here in Indianapolis. Its a four piece band with some of the area's most experienced players. 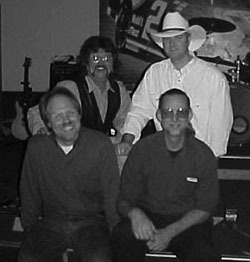 BIG SKY plays a blend of cover songs as well as their own originals. The sound is a combination of Bakersfield country and Nashville. Loren Hunt on lead vocals and rhythm guitar/pedal steel, Brent Boyce on vocals and lead guitar, Billy Young on vocals and drums, Leo Thompson on vocals and bass. All members have played in some of Indy's more popular bands. From blues to jazz to rock, the guys have decided that they enjoy the country sound and are proving it with their playing. LOREN HUNT has been singing country tunes since he was a lad. He adds his rhythm guitar to the ensemble. Loren also writes original tunes for the band. He puts his all into every song that is played. Not only the originals but the cover tunes as well. He played for years in rock and blues bands and lends an excellent talent to BIG SKY. BRENT BOYCE has been playing guitar in various regional and national acts for quite some time. He has toured extensively with the Royal Aces whom were a back up band for many of the stars. Brent has had local bands that have also obtain success. His fluid style of playing makes one think of water over glass! LEO THOMPSON has played everything from jazz to blues to rock to fusion and now to country. He has played the biggest majority of his life and truly believes that BIG SKY might just take it to the top. On bass, he and Nick make a firm foundation for the soaring heights that the other members fly. BILL YOUNG, our newest member came on board in mid December and has polished off the songs with a definitive beat. Bill has played in various bands around the Indianapolis and New Orleans areas and has contributed a great deal to the new sound of BIG SKY. Bill also will be contributing his vocals in the future to round out our sound.